Like many of history's most tragic days, April 16 began so normally, it bordered on bland: the biggest story of the day was supposed to be the weather, the aftermath of that nor'easter. But a storm of a different kind was brewing in the head of a 23-year-old English major named Cho Seung-Hui. And on this day, the world would run on his schedule. "I didn't know yesterday that my school was going to be the site of the largest shooting in U.S. history," student Eddie Logan tells Peter Van Sant. At 7 a.m., at the West Ambler Johnston dormitory, home to Eddie Logan and more than 800 other students, the card-key entry system shut off, as it does every morning. Asked what he thinks about that, security expert Michael McCann tells Van Sant, "There's no reason not to have that system up and running 24 hours a day, seven days a week." "Then, at the very least, you'd know who was going into the building when...you can use that investigative tool," McCann adds. Cho lived in nearby Harper Hall. Shortly after 7 a.m., evidence suggests that he entered Ambler Johnston, headed to the fourth floor and killed freshman Emily Hitchner in her room. Seconds later, residential assistant Ryan Clark was murdered as he reportedly rushed to help. At 7:15, someone called 911 and within minutes campus police arrived at the dorm, assessed the scene, and made a crucial decision. "We concluded first that the first incident was domestic in nature," Virginia Tech President Charles Steger told reporters Monday afternoon. "We got info from witnesses … [that] led us to believe [the] shooter was no longer in building and likely off campus," a university law enforcement official added. Students at the dorm were told to stay inside. But elsewhere on campus, the school day proceeded uninterrupted. No general alarm was sounded, no evacuation was ordered, no warnings were broadcast. "I went about my normal day, hadn't heard anything at all….I went to class as normal," one student told CBS News. It turned out to be a math class in the engineering building, Norris Hall. "How soon should police have notified the students and the college community?" Van Sant asks McCann. "As soon as possible, definitely within the first half hour, preferably within the first 20 minutes, you should be alerting anyone who could possibly be affected on that campus," the security expert argues. At 9:26 a.m., more than two hours after the dormitory shooting, the University sends out its first e-mail, a tame announcement urging students "to be cautious." "That initial e-mail said nothing about two students being murdered," Van Sant remarks. "And there's a good reason for that. You don't want to create any more panic or hysteria than is necessary," McCann explains. As sources told CBS News, Cho returned to his room to scribble his bitter farewell note. Meanwhile, police had detained a "person of interest" in the first shooting. They had no indication further violence was about to erupt. "He was detained, was questioned at the time the second shooting began," the university law enforcement official told reporters. Shortly before 9:45 a.m., Cho is presumed to have entered Norris Hall and chained some of the doors shut, to seal his victims inside. "We heard a series of bangs… everyone was looking around trying to figure out what that sound is," one of the students recalls. The bloodbath commenced with systematic efficiency: Cho moved from classroom to classroom, pumping bullets into teachers and students, pausing only to reload. Derek O'Dell was taking a German class in Room 207, when Cho entered, shot instructor Christopher James Bishop in the head, and moved on to the rest of the class. "There were probably 15-20 people in our class and he shot maybe 10-15 of them," O'Dell explains. In another classroom, an act of heroism took place, as Zack Pelkowitz thought quickly and helped save his fellow students. "I said 'We need to barricade this door,'" Pelkowitz recalls. "He eventually came to our door, tried to open the door, it didn't go, so he tried to shoulder his way in. The door opened about six inches, and we all had to slam it back shut on him." At 9:45 a.m., a student called 911. 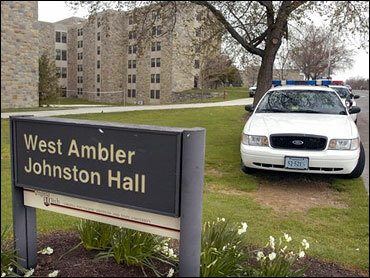 Five minutes later, the university sent out another e-mail, this one much more ominous: "A gunman is loose on campus. Stay in buildings until further notice." Police cut through the chained doors and entered Norris Hall. At this point, the shooting has subsided. The death toll would eventually rise to 33. Cho saved his last bullet for himself.